Results of SED fitting for VHS J0411-0907. The top panel shows the best fitting quasar model photometry (in red) to the data (in black). The blue line is for the quasar spectral template used to inferred model photometry. The filled area in the background represent the Pan-STARRS, VISTA and WISE filters. The second panel below, shows the residuals between the data and the fit, divided by the total errors. The two other panel below show the same thing but for the brown dwarf model. Finally in the bottom panel are shown the 2000 cutouts in each filters along with the AB magnitudes. Credit: Pons et al., 2018. Powered by the most massive black holes, bright quasars (or quasi-stellar objects, QSOs) with high redshift (over 6.0) are important for astronomers as they are perceived as the brightest beacons highlighting the chemical evolution of the universe most effectively. However, such objects are extremely rare and difficult to find. To date, around 100 high-redshift quasars have been found mainly thanks to large-area optical and infrared surveys. This number is still insufficient for significantly advancing our knowledge about the early stages of evolution of the universe. Now, a team of astronomers led by Estelle Pons of University of Cambridge, U.K., reports the finding of another important addition to the list of bright, high-redshift quasars. By employing the near-infrared VISTA Hemisphere Survey (VHS), the researchers have identified a new quasar at a redshift of 6.82, which received designation VHS J0411-0907. The new QSO has been selected by spectral energy distribution (SED) classification using near-infrared data from VISTA, optical data from the Panoramic Survey Telescope And Rapid Response System (Pan-STARRS), and mid-infrared data from NASA's Wide-field Infrared Survey Explorer (WISE). 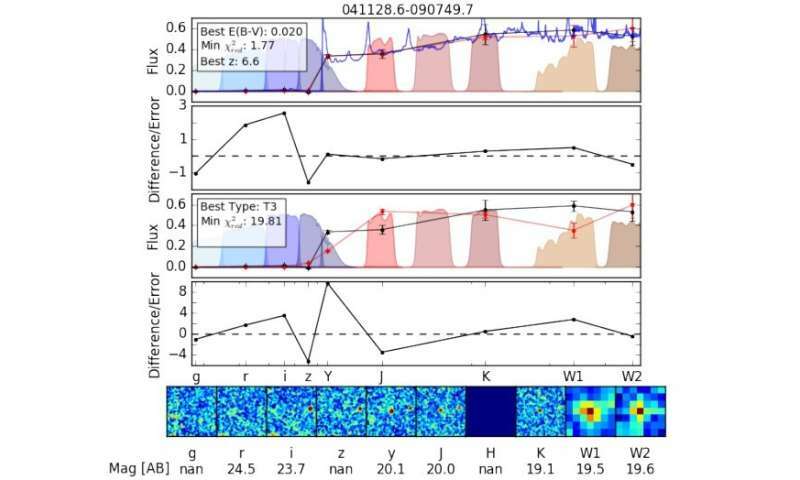 "By combining colour-selection and SED fitting χ2 selection, we found a new high-z quasar VHS J0411-0907 at a redshift of 6.82," the astronomers wrote in the paper. According to the study, VHS J0411-0907 has a bolometric luminosity of about 189 quattuordecillion erg/s, black hole mass of around 613 million solar masses, and an Eddington ratio of approximately 2.37. The researchers noted that these parameters make VHS J0411-0907 the quasar with the highest Eddington ratio and one of the lowest black hole masses among the known QSOs with redshifts of over 6.5. "The high Eddington ratio of this quasar is consistent with a scenario of low-mass BH [black hole] seeds growing at super-Eddington rates," the paper reads. Notably, VHS J0411-0907 has the brightest near-infrared J-band continuum magnitude of the nine known quasars with redshifts higher than 6.7 and is currently the highest redshift QSO detected in the Pan-STARRS survey. VHS J0411-0907 is the seventh quasar with redshift over 6.5 discovered using VHS. Pons' team hopes that further studies using this survey will yield the detection of dozens of new high-redshift quasars. "Based on the Jiang et al. (2016) luminosity function, we expect to detect in 10,000 deg2 of VHS about 20, 34 and 15 quasars with 6.5 < z < 7.0 for the J-band limiting depth of VHS-ATLAS, VHS-DES and VHS-GPS respectively. In addition to about 6, 14 and 5 quasars with 7 < z < 7.5," the astronomers noted.